iSophie: An early arrival, meet the newest family member! An early arrival, meet the newest family member! The delivery was reasonably painless. And that is probably something I have never said before, because all 4 of the boys 'deliveries' were a wee bit painful! 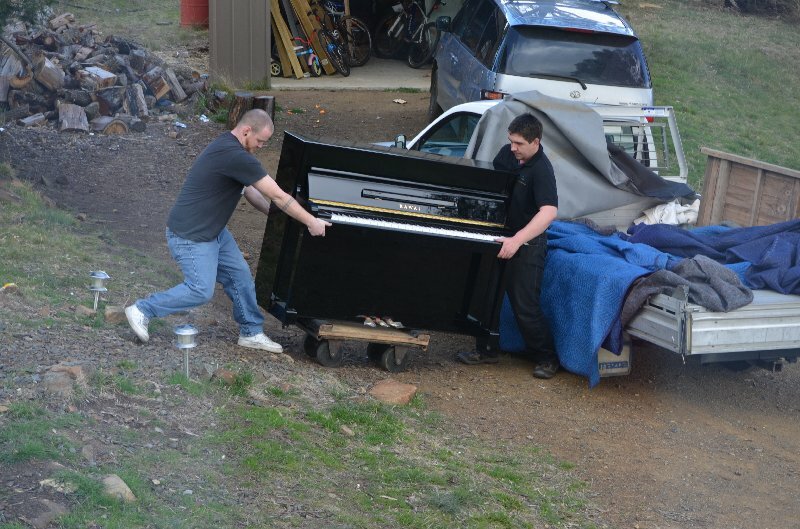 I was skeptical about the abilities of the piano handlers, doubting we would have a intact piano by the end of the process. Happily, I was proven wrong. 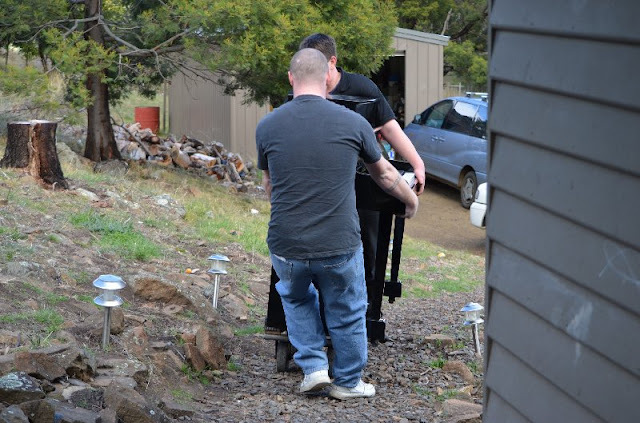 Except for a few hairy moments where the piano was slipping off the trolley as it ascended up out rocky pathway, it went smoothly! From my perspective anyway. Though my keen skills of observation told me that the sweat trickling down the faces of the handlers was not a prop. No stage crew in sight to run in and spray water on faces for added drama and affect. Though he only gave the difficulty a 6/10! Come on, I thought it was more like a 7 and a half! They are the experts however and have delivered to much more difficult locations. I even threw in the added distraction of a 4 and 2 yr old screaming at each other. They were fighting over the toy phone that lives on the side of the play kitchen that had (2 minutes previous) been up against the wall where the piano was going to live. Taken just moments before I enquired if they were enjoying the view. A piano has been on the want list for years. We were going to wait until the house was extended before filling it up anymore. But when Coder mentioned he wanted a pinball machine for Father's Day.. I said "Not until the house is extended!". 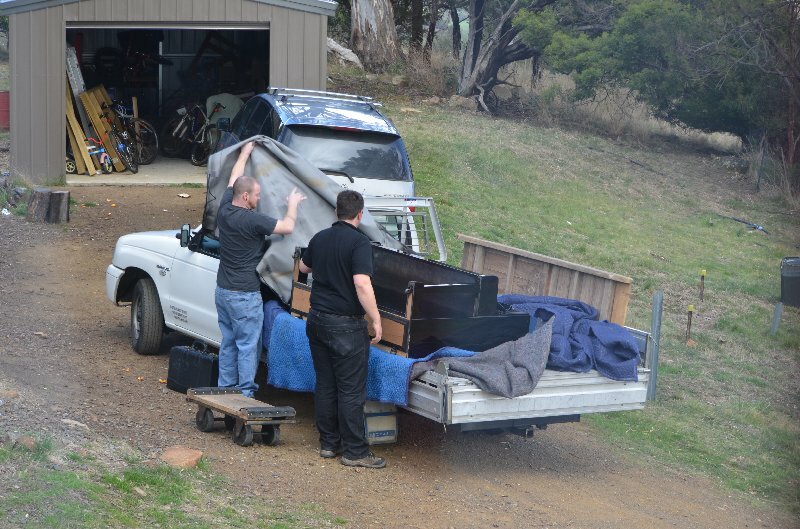 There was no way I was going to try and make room for a pinball machine in the lounge room. Of course he thought I would still get it. So to make sure he didn't get what he wanted... No I am kidding. He really wanted a piano. More then a pinball machine. Honestly. Why a pinball machine in the first place? Well why not? He is an expert now you know. During Oshawott's party, Coder would frequently disappear into the dark arcade. Later I discovered he had joined a pinball tournament and was trying to get the highest score he could to secure his position in the top 5. The top 5 in each location are invited to attend the State tournament. He does this to me occasionally. Surfing for example. When we were holidaying in Coolum he casually mentioned he had always wanted to learn how to surf and proceeded to have some lessons in the days following. Surfing? I have known him for 15 years and this was the first mention ever about surfing. Ever. Sure he didn't have to disclose every tiny bit of information about his interests during that 15 years, but you would think it may have accidentally popped into conversation at some point? Nope. Also, he had always refused to swim in the oceans of Australia (he is American) because he was certainly going to be eaten by a shark. Seems to me like surfing would put you pretty high on the menu. So not entirely new to being sprung with these kind of secret lifetime wishes, I go along with the idea. He seems to be good at anything he tries, he probably can be the next Statewide pinball champion. But we are not having a pinball machine in the lounge room. However, lifetime wish of owning a piano I can do. And I will even allow it to be in the lounge room! It's a second hand Kawai. 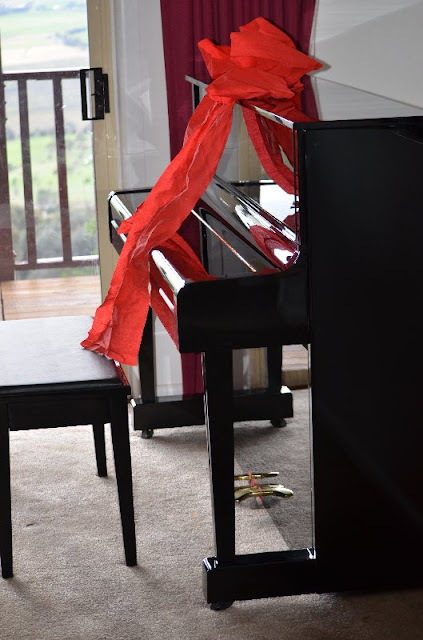 So even though it's a gift for the whole family (and I am pretty sure as soon as Pichu wakes up from his nap I will not be viewing it this way anymore), we surprised Coder with the piano for Father's Day. It was two days early, because if you have ever tried to hide a piano in your lounge room for two days, you'll know it's not easy. Who can play you ask? Well, technically, no one. But I did take lessons for a whole year when I was young so I am sure all my talent (*cough*) will come flooding back. Coder has been teaching himself to play for years, because when you teach yourself something like that it's going to takes years! Hopefully 1 or 2 of the boys may show enough interest to want lessons. I am considering taking it up again. My Dad started to learn in his 50's, so I can do it too! Not that i'm 50, but you know what I mean. 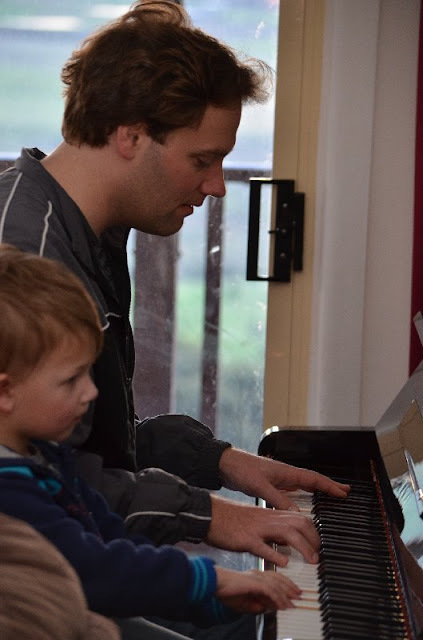 In 20 years we will sit around the piano at Christmas time, all 4 boys, Coder and myself taking turns to play Christmas carols as my Lamborghini is driven up the driveway to surprise me. Oh wait, that's right, the Lamborghini? That's one of Coder's life wishes too! Hi, visiting from PotMC. I've always wanted a piano, but we've moved something like 6 times in the last seven years so it just isn't in the cards for us until we settle down a bit. I hope your family puts it to use! Thanks for stopping by! Hubby has already spent hours on it. Yay! Congratulations! So impressive that he taught himself :) I must admit that a pinball machine (or PacMan video game) would be loads of fun too. We have a ping pong table which we've really enjoyed. Very happy to have it inside in one piece! Thanks Jane. It's been a week and it is still used everyday, hopefully a good sign.